Spirometry measures the total amount of air you can breathe out from your lungs and how fast you can blow it out. You will be asked to take a very deep breath and blow out as fast as you can into a mouthpiece until no more air comes out. Spirometry can help to assess if inhaled medication or inhalers can open up your airways by reversibility testing. This is when your health care professional asks you to use your inhaler or other medication, wait some minutes, and then repeat the test. A spirometry test usually takes less than 10 minutes, but will last about 30 minutes if it includes reversibility testing. There are various spirometer devices, but they all measure the same thing. Many GP surgeries now have small, portable spirometers. Some spirometers are more sophisticated and can give more detailed results. It can help tell if your breathing is obstructed by narrowed or inflamed airways. The results are useful in diagnosing lung conditions. For some conditions, it can be used to grade how severe your condition is. You will be asked some questions before you start to check that there is no medical reason why you should not do the test. It is important to put as much effort into the test as you can so the results are accurate. You may have a clip put on your nose to make sure all the air goes into the mouthpiece. You will be shown how to blow into the spirometer before starting. You may be asked to blow three or more times into the spirometer to check the readings are similar each time. Normally, you will be first asked to breathe in deeply and out gently. Once your health care professional is happy with the results you will move on to the next part of the test. You will have to breathe in again deeply, this time quite fast, and then breathe out as fast and as hard as you can until your lungs are empty. Your health care professional may ask you to use your inhaler or other medication, wait 15–20 minutes and then repeat the test. For some drugs the wait may be 45 minutes between tests. This is called a reversibility test to see if the medication improves your breathing. If you use inhalers, you should bring them to your appointment. how much air you can blow out in a relaxed manner, like a gentle sigh out until your lungs are completely empty. This is called your slow vital capacity or VC. the amount of air you can blow out in one second. With healthy lungs and airways, you can normally blow out most of the air from your lungs in one second. This is called your forced expiratory volume in one second or FEV1. the total amount of air you can blow out in one complete breath after taking a deep breath in. You will be asked to blow out as hard and as fast as you can until your lungs are completely empty. This is called your forced vital capacity or FVC. your health care professional will look at how much air you can blow out in the first second and compare this to the total amount. This will give a percentage of air you can blow out in the first second. This is calculated by looking at your FEV1 and your VC. The format in which the results appear will vary depending on the type of spirometer used. Normally, your health care professional will compare your measurements with the normal range of values. The curves drawn by the spirometer are also important for your health care professional to understand your results. Think of a five-lane motorway that has been reduced to three lanes due to roadworks. The traffic will take longer to travel through that stretch of motorway. In the same way, if your airway is narrower than normal, it will take you longer to empty your lungs of air. A spirometer records how much air you can breathe out in one second. That will be less if your airways are narrower than someone of your gender, age, height and ethnicity with healthy airways. It can also compare that result to how much air you breathed out altogether, and this ratio measures how much your airways are blocked. In someone with healthy airways, at least 70% of the total air they breathe out would be expelled in one second. If your best effort is below the minimum value (Min), your result is below what it is expected it to be. This information and the shape of the loop will help your health care professional understand your results. 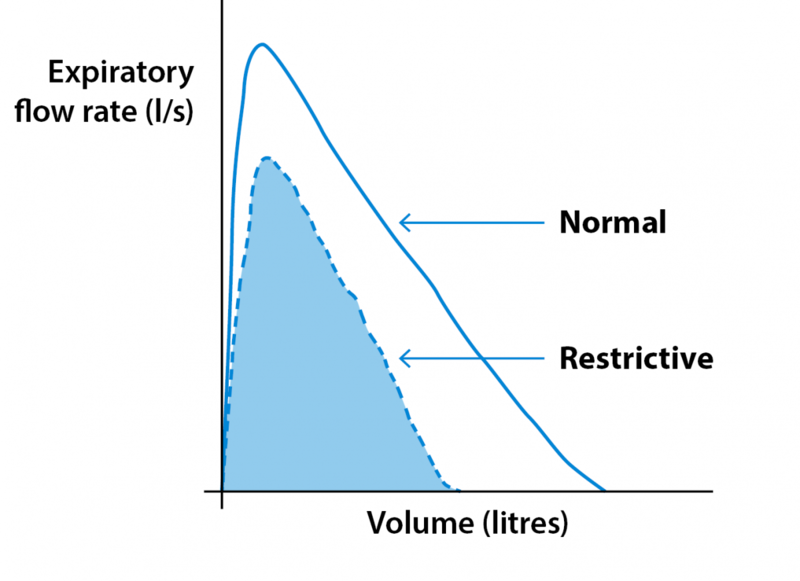 The normal range is calculated by the spirometer based on your height, age, gender and ethnicity. If your lungs and airways are healthy, you can blow out most of your breath in the first second. This pattern tells your doctor that your spirometry test is normal when compared to the expected results for you. An obstructive pattern is typical if you have a lung conditions that narrow your airways, such as COPD and asthma. This means that the air flows out of your lungs more slowly than it should (low FEV1) with less than 70% of the total amount in the first second. Spirometry can help to assess if inhaled medication or inhalers can open up your airways by reversibility testing. Usually, medication is more effective if you have asthma. Reversibility testing helps to grade the severity of COPD and other conditions according to your FEV1 measurement after you have taken a medication to relax and widen your airways. Mild FEV1 is 80% or more of the predicted value. If you have mild COPD, you spirometry test results can be normal after you take medication. With a restrictive pattern, the total amount of air you can breathe in is reduced but the speed you can breathe out is preserved. In this situation, both the FEV1 and FVC will be lower than predicted, but the ratio between the two will not be reduced. This is caused by various conditions that affect the tissue of your lungs or affect the capacity of your lungs to expand and hold a normal amount of air, such as pulmonary fibrosis. This pattern can also be seen in people who are significantly overweight, have an abnormal curvature of the spine or weak breathing muscles. Sometimes these two processes (obstruction and restriction) combine – where both the total amount of air and how fast you can blow out are reduced. This happens in severe emphysema or cystic fibrosis, and can also happen if someone is obese.